And that's to scan accurately, every time. High quality barcodes scan better. A few factors determine the quality of your barcodes, and understanding your options will help you make better choices. Because bar codes are often used within larger work processes, some decisions are made for you by the job at hand. If you have to produce camera-ready artwork for offset printing your workflow might dictate the production of PDF files. If so, then learning to tweak Acrobat's settings for the best resolution is your goal. When printing in an enterprise setting the most important thing might be which printer on your network to use. Inkjet printers dictate choosing fonts carefully because of the limited resolution and the inevitable ink spread. Some conditions affecting barcode scannability are general printing considerations while others are symbology-specific. Each bar code symbology tends to be used in specific situations with specific requirements. Different symbologies present their own unique printing challenges. Scanners work by analyzing alternating patterns of black and white. In general, the larger the target, the easier it is to scan. Don't crowd your bar code. Leave an adequate clear zone of white space on both sides, left and right. The darker the bars and the whiter the background, the greater the contrast. Sharp, crisp edges make the scanner's job easier and allow you to produce smaller symbols. The higher your printer's resolution, the smaller the dots, and the crisper your edges. This is why you can print smaller bar codes with a laser printer than you can with an inkjet printer. 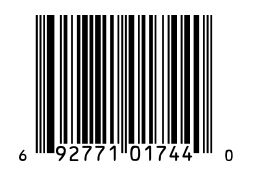 A laser printer produces cleaner dots and hence makes crisper bar codes. Choose your printer carefully. Going from 300 dots per inch to 600 dots per inch results in a fourfold increase in resolution, not double (300x300=900, 600x600=3600). The stock you print on has a direct bearing on how good your bar codes are. The better the paper, the better the bar codes. Papers manufactured for laser printers work better than bulk, cheap stuff. Bright white surfaces provide better contrast. We all love and support recycled paper but it lacks the lignin of virgin paper. Without lignin the fibers fall apart and tend to clog things like the innards of your printer. The solution is a vacuum cleaner or canned air. If you'll be printing lots and lots of the same bar code(s) consider using a commercial printshop, not your desktop printer. Pro printers can often offer cheaper unit costs, and better print quality. When making camera-ready artwork for print jobs, go to an image-setter with resolution greater than 1000 dpi. All of Azalea Software's barcode fonts have the embed tag set to 'Print & Preview' to facilitate the creation of Acrobat PDF files. When making PDF files, limit how much you compress the file: compressing a barcode file will alter text and line art, possibility affecting scannability. Don't leave file-saving to your program's defaults because it will create a PDF file targeted to optimal screen resolution, rather than print resolution. While you'll end up producing a larger file, you want the increased resolution to make scanning easier. Which specific font should I use? Which font within a particular Azalea software package you select has an impact on your bar codes' scannability. This is a symbology-specific variable. For instance, UPC and EAN bar codes are often part of product packaging printing on offset presses. The ink on the printing press tends to be absorbed by the paper and spread away from the center, resulting in wider bars and narrower spaces. If you know this up front, use one of the pre-narrowed fonts within UPCTools that compensates for the ink spread. Bar-width reduction is a concept rooted in UPC bar code printing. The same holds true to a lesser degree for other bar code symbologies. While the tolerances for other symbologies aren't nearly as demanding, ink spread and bar width reduction must still be kept in mind. For example, ink spread is definitely an issue when printing Interleaved 2 of 5 symbols on corrugated cartons using serigraphy. If you're printing Code 39 barcodes, there are three families of 9 fonts in the collection. A third have a 2:1 wide:narrow ratio, a third have a 2.5:1 ratio, and the last third have a 3:1 ratio. If you're printing large symbols that will be scanned on a shelf from afar use the Wide fonts with the 3:1 ratio to help the scanner decode the symbol at a distance. Analyze your work process focusing on the generation and printing of the bar codes. Look for choices that impact symbol scannability. The better the barcode, the easier it is to scan, and the greater the benefits of using auto ID technology. Consult your software documentation for other symbology-specific tips and hints.